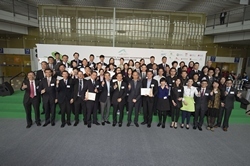 HONG KONG, 2015-3-30 — /Travel PR News/ — The HKIA Environmental Management Recognition Scheme, organised by the Airport Authority Hong Kong (AAHK) to recognize the environmental performance of airport tenants, came to a successful finale, with an award presentation ceremony held today. A total of 42 airport tenants were presented with different awards to commend their exceptional effort in environmental management. The ceremony was officiated by Mr. Wong Kam-sing, Secretary for the Environment, and Mr. Fred Lam, Chief Executive Officer of the AA. This entry was posted in Airlines, Airports, Business, Transportation, Travel, Travel Awards, Travel Management and tagged Airport Authority Hong Kong, airport tenants, effort in environmental management, Mr. Fred Lam, Mr. Wong Kam-sing, The HKIA Environmental Management Recognition Scheme. Bookmark the permalink.